How can I show my client the itemized deductions even though the return is calculating the standard deduction? The option to produce the Schedule A even when the standard deduction is used by the return can be set globally or on a return-by-return basis. By going to Setup > Options > Form & Schedule Options, you can globally select to produce Schedule A even when it is not required. 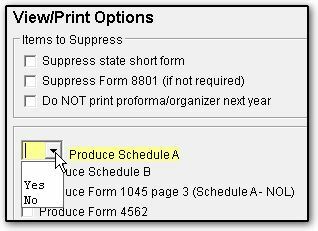 The option Print Schedule A only when required is listed under Select to Turn On. If this option is cleared, Schedule A is generated with each individual return even if the standard deduction is used in the return. To produce/suppress the Schedule A on a return-by-return basis, go to the Miscellaneous tab of data entry > PRNT - Print Options screen. On this screen is a drop list to Produce Schedule A. This does not affect return calculation but causes a Schedule A to appear in View/Print mode for reference. Note: Drake Software automatically calculates whether itemized deductions or the standard deduction are more advantageous to the taxpayer. To force the return to use itemized deductions rather than the standard deduction, open the Schedule A data entry screen and check the box to Force Itemized.